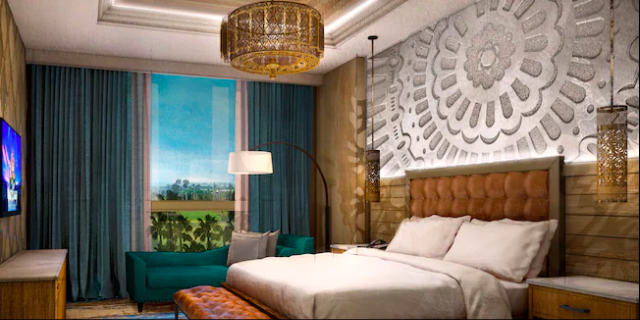 Walt Disney World’s newest hotel, Gran Destino Tower at Disney’s Coronado Springs Resort is set to open on July 9, 2019. Reservations for Gran Destino are now available online, through your travel agent, or by calling 407-W-Disney. To book a room at the Gran Destino Tower online, look under Disney’s Coronado Springs Resort. In addition to several room categories, including Club Level and suites, Gran Destino Tower will also house a restaurant: Toledo – Tapas, Steak & Seafood. According to Disney it will feature beautiful views of Walt Disney World Resort and offer a lounge with indoor and outdoor seating. Most rooms sleep up to 4 adults with 2 queen beds. King bed rooms sleep 2 adults. The Executive Suite and 1-Bedroom suites both sleep 4 adults. The Presidential Suite sleeps up to 6 adults. Big news for Disney’s Coronado Springs Resort this week! All 1,800 rooms have now been fully updated with new fixtures, furnishings and lighting. If you’ve ever stayed at Coronado Springs you know it’s a long walk from many of the rooms to the main lobby. Disney announced that new walkways will stretch across the lake will help shorten the trip. Plus a new restaurant is in the works and will be situated on an island in the middle of the lake! 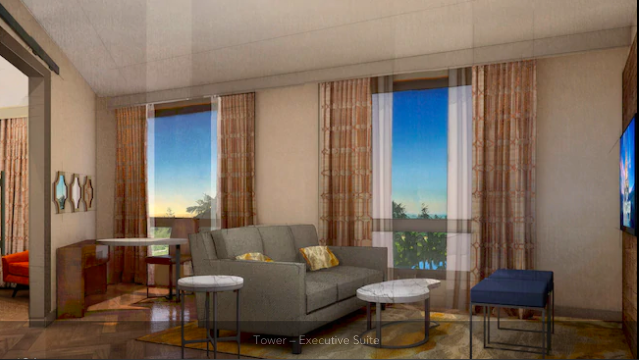 The new tower, to be completed sometime in July 2019, will serve as the new main entrance at Disney’s Coronado Springs resort, and will add 545 Guest rooms and 50 suites, as well as feature a two-story lobby. A second themed table-service restaurant is also planned for Coronado, this one at the top of Gran Destino Tower, which will offer views of the Walt Disney World Resort. Finally the Disney Skyliner will be operational sometime in the Fall of 2019. You’ll be able to book the Gran Destino Tower at Disney’s Coronado Springs Resort soon, according to Disney. Stay tuned. Update on Disney's Coronado Springs Resort Expansion Project. Recently I shared with you that Disney's Coronado Springs Resort will be expanded. A 15-story tower is being planned that will add 500 additional rooms to this Moderate resort. I just received some clarification on the extent of the refurbishment work that will be going on and it's good news! There will be minimal impact on the overall guest experience at Coronado Springs. Some construction fencing will be seen at the resort, with work happening behind the fencing. Additionally, noise will be heard while the Resort is undergoing refurbishments, but noise should not be heard from inside Guest rooms prior to 9 a.m. daily. During this time, dining and merchandise locations, pools, and the La Vida Health Club, and recreation activities such as beach volleyball, Iguana Arcade, Movies Under the Stars and more, will remain available.